CHRISTMAS is supposed to celebrate Jesus’ self-giving and his “lifelong crusade” to bring back humanity into God’s embrace, Vice Rector Fr. Richard Ang, O.P. 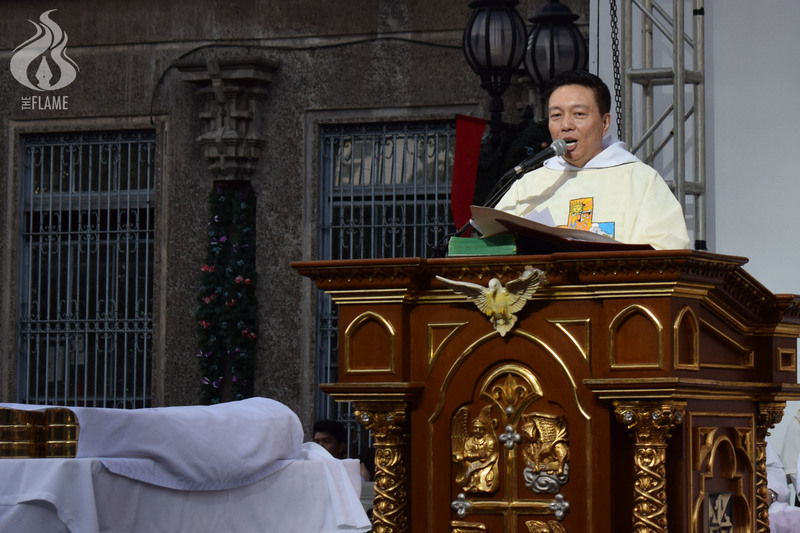 said Monday in his homily for the annual Paskuhan Mass. “[God] will go to great lengths, do everything humanly possible just to bring us closer to him. [K]aya tuwing pasko, may pagbibigayan sa isa’t isa at may pakikipag-ugnayan sa bawat miyembro ng pamilya,” he said. Ang praised the “beautiful” decorations and lights in the University but reminded Thomasians not to forget the meaning behind their lighting. The Vice Rector encouraged students to remain resilient and to learn how to carry their burdens, reminding them that Jesus promised peace and not an easy journey. “The peace [Jesus] offers is the kind of peace that will allow us to experience serenity in the face of all circumstances that would cause us pressure. Kahit magbagsakan na ang lahat ng mga bagay sa paligid mo, pati na [ang] mga grade mo, makukuha mo pa ring ngumiti,” he said.